Prepare cake following box instructions. Line a cupcake holder with cupcake liners. Fill each cupcake with 2 1/2 tablespoons cake batter. Bake cupcakes according to box instructions. Allow to cool for 30 minutes. Frost all cupcakes with chocolate frosting. Toast marshmallows until crisp. I did mine over an open flame, but a toaster oven works well too. Stick a piece of graham crack into the top of each cupcake. Add a toasted marshmallow to the top. You can add mini marshmallows on a kabob to the top instead of a large one, or use flavored marshmallows. I go camping with my family about once a year a so. My favorite thing to do around the fire is making s'mores. It’s a comforting and easy little snack to do. Plus it’s a fun little event that everyone can be a part of! However, when I don’t have a camping trip in the horizon, I get my s'mores jones out by making them at home. I, of course, put my own twist on them: I make them with chocolate cupcakes! I use Betty Crocker™ cake mix for the cupcakes and then I toast the marshmallow either over an open flame on my stove or I use our outdoor fireplace. 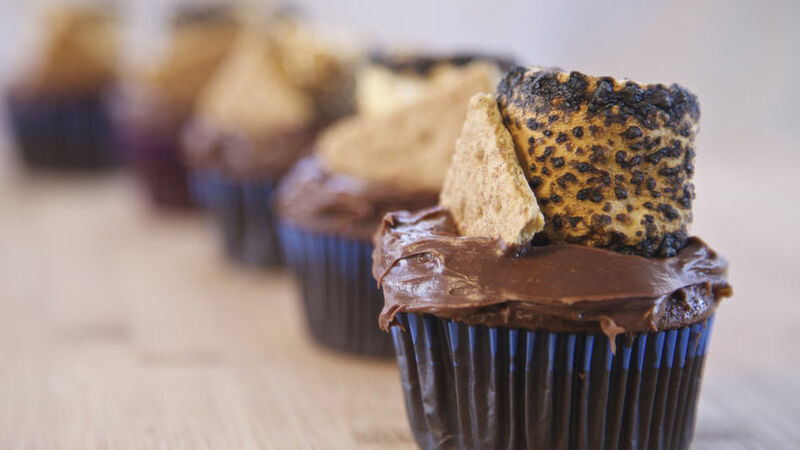 I simply add a piece of graham cracker to the top, and my s'more cupcakes are ready to go!